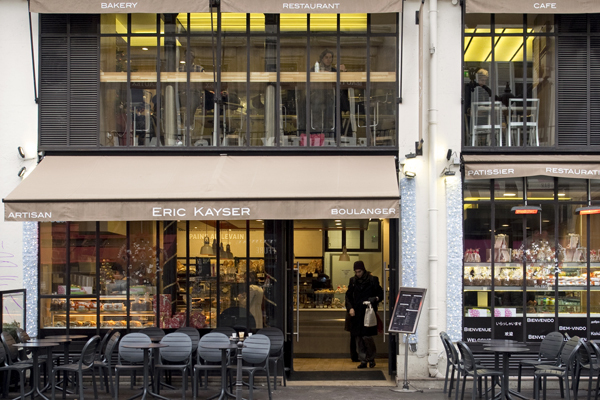 In Paris, Eric Kayser has long been a household name. Known as a master boulanger (bread baker) and a skilled restaurateur, he’s developed Maison Eric Kayser into a small empire. Not only does he do it all, but he also expertly develops his recipes and carefully sources his ingredients. Of course, this means that everything you’ll find at his fast casual restaurants is so delicious, you’ll want two. Fortunately, at Maison Eric Kayser gluten-free options include everything from crusty bread to healthy salads to decadent desserts. 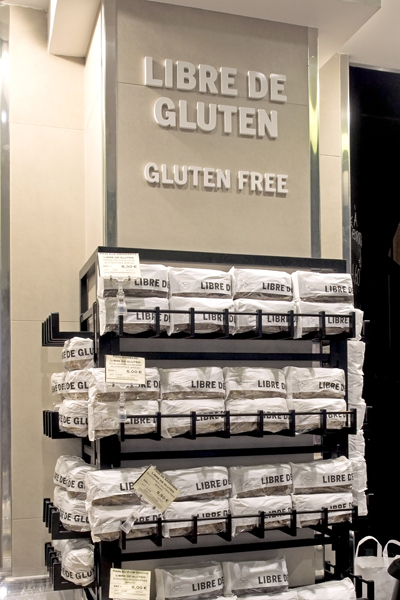 Since the café isn’t a gluten-free environment, at Maison Eric Kayser gluten-free products are baked in a separate facility and then double-packaged in order to prevent cross-contamination. Because each of Kayser’s cafés is different from the last, you’ll only find these gluten-free products at the location near the Louvre in the 1st arrondissement. There are plans to expand the line’s availability or perhaps introduce a completely gluten-free location, but nothing certain has been announced as of January 2015. Eric Kayser comes from generations of expert bread bakers, so it’s no surprise that this is where he truly excels. 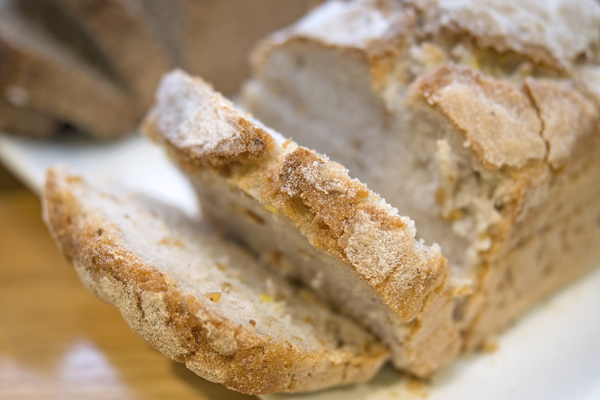 Gluten-free bread is somewhat of a new concept in France, where culinary traditions run deep. Kayser, however, has so far developed four bread recipes, each unique. All of his recipes include different flour blends, but none of his recipes include xanthan gum or additives, which means they’re best enjoyed fresh. Kayser’s pain de sarrasin, or buckwheat bread (left), is made with 100% buckwheat flour. This is a dark, hearty bread that can easily replace rye bread (reuben sandwich, anyone?) or be topped with smoked salmon or another dense topping. The gluten-free pain aux mendiants, or bread with dried fruit and nuts, is a lighter and sweeter bread best topped with a soft cheese or smear of jam. 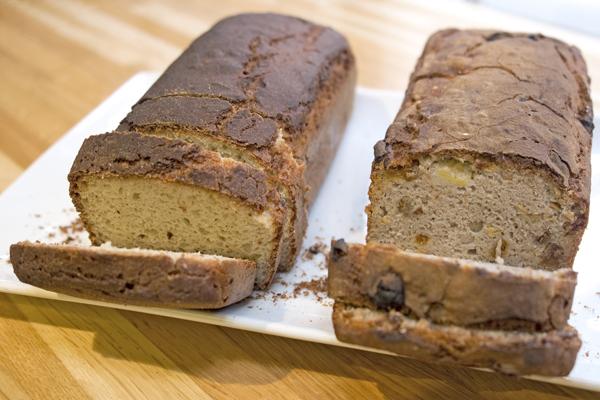 Not even close to resembling a fruitcake, this is an excellent breakfast bread. The pain gonesse, or rice and buckwheat bread, is Eric Kayser’s simplest (and arguably most successful) bread. It boasts a perfectly crusty exterior, a lusciously soft interior, and a delicious sourdough flavor, thanks to the rice-based starter. This is exactly what you want in a sandwich bread, though it’s also divine when lightly toasted and buttered for breakfast. Fans of a denser bread will love the pain au pois chiche, or chickpea bread, which is also excellent for sandwiches. A note to gluten-free travelers: if you’re visiting Paris and want to enjoy a loaf of Eric Kayser gluten-free bread, be sure that you have access to an oven in your apartment or Airbnb. This bread is sold parbaked and must be baked in an oven for a few minutes to attain that delicious crust. This isn’t at all unusual in France but is worth noting to avoid disappointment. Eric Kayser’s intention with his gluten-free line is to offer gluten-free eaters options just as diverse and gourmet as the standard offerings. You’ll find a lunch spread with a variety of both gluten-free salads and sandwiches, with a little something to appeal to everyone. 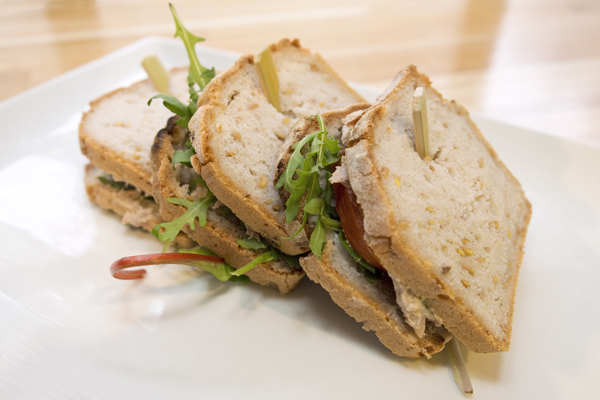 All of the gluten-free sandwiches are made with the fantastic rice and buckwheat bread, and with fillings like tuna, smoked salmon, and chicken salad, you can’t go wrong. The sandwiches come in threes, for a filling and satisfying meal. For something a little less bready (or, let’s be serious: for something to accompany your bread), Maison Eric Kayser also has a full line of salads. From salmon to green detox to Parisian mix, vegetarians and omnivores alike can find something tasty and fresh. 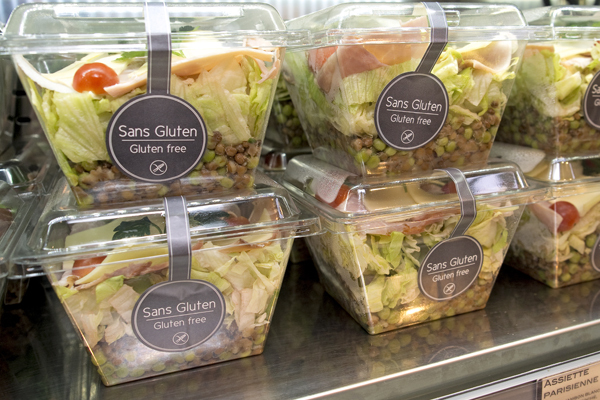 All salads are individually packaged and clearly labeled with a sans gluten sticker to ensure they are safe and healthy to eat. Be sure to save room for a sweet treat after lunch, as the gluten-free sweets at Maison Eric Kayser are a must. 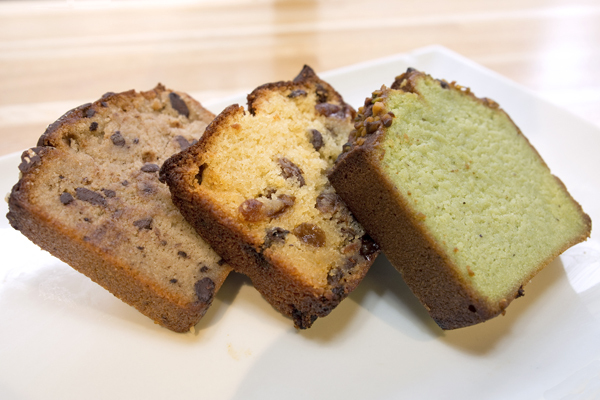 The pistachio, chocolate, and dried fruit cakes are available by the slice or by the cake. Grab a bite or an entire cake, just be sure to try the buttery, sweet pistachio. Cookie fans, take note. 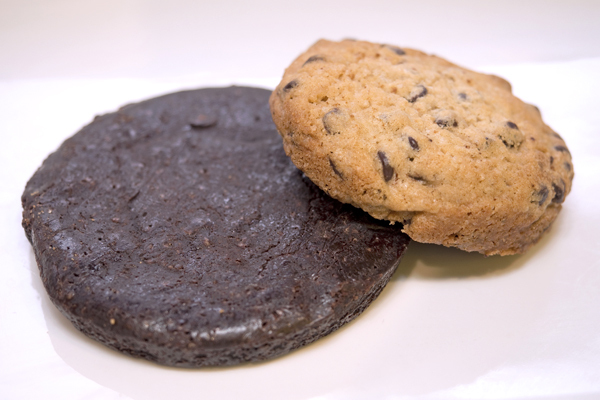 You won’t find many cookies in Paris, but Kayser has perfected gluten-free chocolate chip and straight chocolate cookies. If you’ve only got room for one sweet, we recommend the chocolate indecent above all. Essentially a denser form of chocolate mousse, this treat is ridiculously rich and is sure to please any chocolate enthusiast. Where? Visit Maison Eric Kayser in the 1st arrondissement: 4 rue de l’Échelle, 75001 Paris, France (+33 1 40 15 01 31). Disclaimer: Maison Eric Kayser graciously hosted us so that we could share our experience with gluten-free readers around the world. As always, all opinions and enthusiasm are our own. any recipes available for any of these GF breads? I believe the recipes are proprietary, but if you have allergy concerns, the staff can certainly address them.